He just hit his 30th HR against the Rangers. Alex Rodriguez was previously the youngest at age 22 (actually a 40-40 season). Trout was 20 as of June 30. He is currently 6th in the AL in WAR. He has never finished in the top 10 before and he is 36 (or was as of June 30). Off the top of my head, I can't think of anyone who might have cracked the top 10 for the 1st time so late in his career. Who else might have done something like this? He has 5.1 and 10th place has 4.7 (Pujols). So with only 5 games left, it looks like he will make it. His highest WAR before this was 5.0 in 2009. For ages 36 and older, a WAR of 5.0 or higher has only been reached 47 times. Randy Velarde was 4th in the AL in 1999 with a 6.7 at age 36. It was his only top 10 finish ever. I think his next best year was 3.2. Al Oliver made it for the first time in 1982 at age 35. He was 10th in the NL with 5.7. He is the only player with a career AVG of at least .300, 1000+ XBH, 1500+ BBs, 150+ SBs and 1500+ RBIs (Barry Bonds just missed it with a .298 AVG). Through 1990, Who Were The Only 3 Players With 1000+ RBIs, 250+ HRs, 250+ SBs and 2500+ Hits? Answer tomorrow. It was fun for me to discover who they were. Two will seem obvious but the third one might not. I imagine alot of people will go to Baseball Reference or use the Lee Sinins Complete Baseball Encyclopedia. Two are among the all-time greats (one is a household name while the other is among baseball fans, too) while the 3rd was just very good and is probably not a household name and maybe never was. I did this search because a question came up in the Hornsby chapter of SABR. Who are the only two guys with 1200+ RBIs, 250+ HRs, 300+ SBs and 3000+ Hits? Who Was The Most Surprising Triple Crown Winner? This is similar to a couple of posts that I did last April. See Who Was The Least Likely Triple Crown Winner? and Baseball's Elite, Its Millionaires. 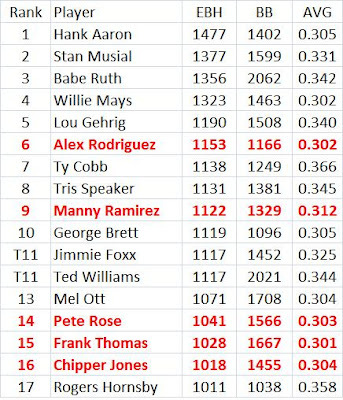 In those posts I used all of a player's career stats to determine the rankings (Ruth was the most likely to do it among the guys who never did). Here I looked at each guy who won the triple crown but his rating was based only on what he did before his triple crown season. 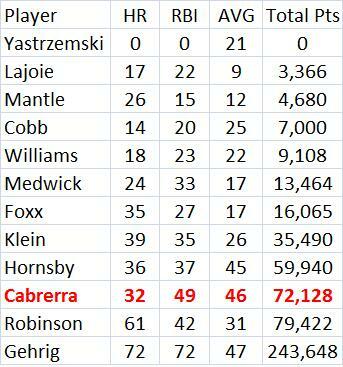 For Williams and Hornsby, I used their first time (I also only looked at guys since 1900 this time). A player would get 10 points for each time he led his league in HRs, 9 for a 2nd place, etc. The same was done for AVG and RBIs. So the player had a career total number of points for each stat. A tie for 1st was still worth 10 points. Then those three numbers were multiplied times each other (meaning if a player never finished in the top 10 in one of these stats, his total will be zero). So Yastrzemski was the most surprising. He did not make the top 10 in either HRs or RBIs in his six seasons before he won the triple crown (he was also the least likely to win using career data since 1900). Cabrerra would not be that big of a surprise, especially considering that he has led the league in all three stats in different years already. Gehrig was not a surprise at all he had been in the league leaders for several years in all three stats many times. Maybe his age of 31 made it a little more surprising. But it is not like his career was in decline before that. Maybe as wise as Fred Merkle. At least the White Sox won't lose a playoff spot or first place finish in this case. Check what happened in the 8th inning today. BR means Baseball Reference and FG means Fangraphs. I don't know why they are so different on WAR. I also don't know if FIP, xFIP, Sierra and tERA are park adjusted. It looks like BR gives Sale about a 106 for pitching in U.S. Cellular Field and Strasburg does not seem to get adjusted much, so his park must be neutral. So for the league %'s on FIP, xFIP, Sierra and tERA, we could multiply what Sale has by about .94. He would still be higher than Strasburg, but a little closer. He is at 9.9, tying him for the 47th best season with Ernie Banks (1959) and Rogers Hornsby (1927). Trout bats leadoff and last year in the AL leadoff men got 6-7% more walks + ABs than a cleanup hitter (I guess that most of the great seasons were by 3 and 4 hitters). Should we reduce his offensive WAR by that much to equalize things? I don't know, but even if we did, it would only lower his offensive WAR to 6.862 (I lowered it 6%). But with his defensive WAR of 2.7, it would still leave him with a WAR of 9.5-9.6, tied for no worse than 64th. If we stick with his WAR of 9.9, the only players to ever have a better season than that who are not in the Hall of Fame are Barry Bonds, Sammy Sosa and Alex Rodriguez. Update: Through games of Sept. 10, he is at 10.2. That is tied for the 28th best season ever. Fangraphs has him at "only" 8.6. But that is just in 118 games. If he did that for 162 games, it would be 11.8, good enough for the 23rd best season ever at Fangraphs. Over 154 games, it would be 11.2, tied for the 32nd best season ever. Going back to Baseball Reference, if Trout kept up his pace this year for 162 games, he would have 14 WAR, beating Ruth's record of 13.7 in 1923. Over 154 games. Trout would get 13.3 and that would be 2nd to Ruth. If Trout keeps up his current pace over the last 21 games, he will finish with a WAR of about 12. That would tie Hornsby and Yastrzemski for the 4th best season ever. Trout had one game where he pinch ran in the 8th inning and the game ended in the 9th. He had no putouts or PAs or SBs. Update: Through games of Sept. 11 he is at10.4, tied for the 24th best season ever with Yount (1982) and Bonds (2004). If he can make it to 11.4, he will crack the top 10. Not too easy, since it would be a WAR of about 1.0 in 20 games or 8 for a full season. He is obviously capable of that, of course. Update: Through games of Sept. 20 he is at 10.1. Over his last 8 games, he has been .3 below replacement. He was 6 for 30 in those 8 games with just 1 extra-base hit (2B), 5 BBs and 1 SB. Update: Through games of Sept. 22 he is at 10.4. Update: Through games of Sept. 27 he is back down to 10.5. So he falls to 24th place. Update: Through games of Sept. 28 he is back down to 10.4 even though he was 2 for 5 with a HR and a 3B. So he falls to a tie for 24th place. Update: Through games of Sept. 30 he is back up to 10.5. The Angels played a doubleheader on Sept 30 after being rained out the day before. They are now tied for 1st place with the Yankees yet they have a run differential of -19. Their record is 76-59 and 24-7 in 1-run games. Here is one thing that might be the difference. 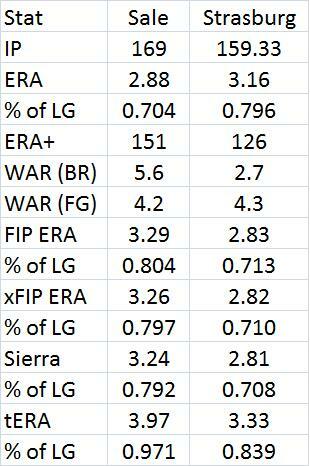 Their batters have an OPS of .722 while their pitchers have allowed an OPS of .724. That should give them just about a .500 record. But in close and late situations their batters have an OPS of .697 (probably a typical dropoff) but their pitchers allow just a .598 OPS. Maybe that is why they wins so many close games. In the AL this year the overall batting OPS is .733. In CL situations it is .683. So the Orioles only drop off .035, not the norm of .050. 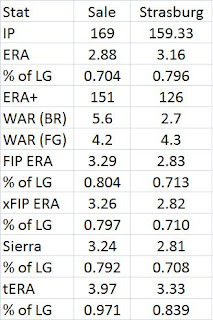 For AL pitchers, the overall OPS allowed is .729. In CL cases it is .674. So the Oriole drop off is .126 while it is just .055 for the league. That would give them a .526 Pct. Then they should have 71 wins but they really have 76. So there are still 5 wins not explained. Baseball Reference gives the Orioles hitters a clutch rating of 2.9, meaning that they tend to hit better the more runners on base, the closer the score and the later the game. So they have won 2.9 more games than you would expect from their hitting than you would normally expect. Pitchers have 6.8. That adds up to 9.7. If they were to win only half their games, it would be 67.5. But if you add 9.8 to that you get 77.3. Very close to their actual win total of 76. They just perform better when it matters more. The list is below. Only 17 players have dones this and the numbers are only through 2011. Jones still has a .304 lifetime AVG. AROD is down to .301. All 12 of the eligible players on this list are in the Hall of Fame. The non-eligibles are in red. 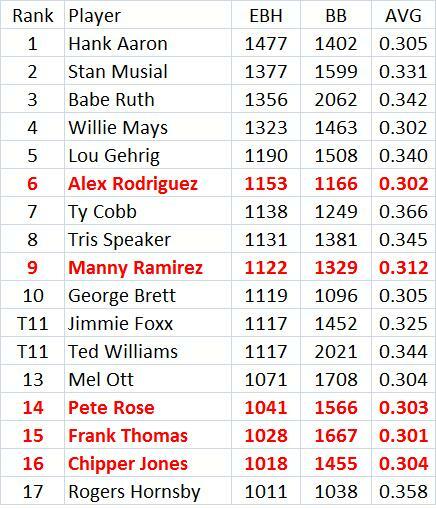 To be on this list you need power, patience and the ability to hit for average.